One truth I have learned over the years is that the Lord opens doors of opportunities, service and blessings for us to walk through. But He also closes doors…and if He closes one door He will eventually open another one. As 2016 comes to a close and 2017 looms upon the horizon, no doubt many doors have been swung open throughout the year as well as doors having been closed. While waiting for a new door to open we must be patient when one shuts to not try and pry it open again while we wait for the new one to open. As a New Year approaches let us pray for the wisdom to know the difference. Whether it be a door of opportunity, a door of service, a door of relationship, a door of fruitfulness, a door of usefulness, a door of friendship, a door of faith, or a door of a new beginning we need to pray that the Lord will give us the wisdom to know when to go through a door and the wisdom to know when He has closed a door. 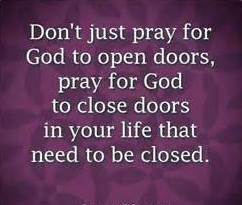 And when He shuts a door may we submit to His will until He opens a new one. The Good Lord opens doors for a reason and He, as well, shuts a door for a reason. Some doors are not meant to stay open forever, but only for a season. If we do experience closed doors in our journey of faith the Book of Hosea encourages us, “And I will give her vineyards from thence, and the valley of Achor (lit. trouble or turmoil) for a door of hope” (Hosea 2:15). The verse speaks of the Lord opening a door of fruitfulness and hope in the midst of the valley of despair, disappointment, and discouragement that often occurs when we confront closed doors. May the Lord give us patience and open our eyes to see the new one He places before us. If we are truly trusting the Lord He will in His timing open the doors which need to be opened and close the ones that need to be closed. Again, let us pray for wisdom to know the difference. 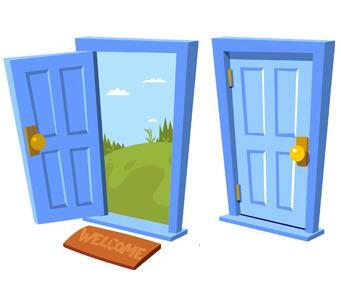 So let us as we face the New Year trust the Lord to open the right doors and close the doors that would be for our determent realizing He closed it for our protection and good, and He opens new doors for His service and our blessing. Revelation 3:8 reads, “I have set before thee an open door, and no man can shut it.” My prayer is that we will walk close to the Lord so our spiritual eyes will recognize such doors and the courage to walk through them. ← WAS THE ANGEL GABRIEL RIGHT?